The next time one passes your way, take a close look at the U.S. Coast Guard&apos;s heavy weather rescue vessel, the venerable 47-foot Motor Life Boat or MLB. Or, check out any of their other aluminum response craft including the very latest 45-foot Response Boat Medium or RBM, one of which I recently sea-trialed (its all-electronic control system utilizes a joystick rather than helm wheel, which is perfect for today&apos;s teenaged recruits). Check out the paint job on these aluminum vessels. What you&apos;ll notice, other than the familiar diagonal red, white, and blue Coastie stripe and bottom antifoulant, is that these vessels are unpainted. Although the Coast Guard is well known for its thriftiness, this approach saves more than simply the cost of the paint. In the long run, it saves the Coast Guard and any other aluminum vessel operator that follows this paint-free protocol untold sums in paint, metal maintenance, and repair, and increases the service life of alloy vessels. Hard to believe? Read on. Although technically an element, with the symbol AL, most aluminum that&apos;s in use (as opposed to ingot form) is actually an alloy, having been mixed with various other elements such as copper, zinc, magnesium, manganese, and silicon. The marine grades of aluminum, 5000 and 6000 series, are alloyed exclusively with magnesium or magnesium and silicon, as any other alloying elements increase corrosion potential. Aluminum is the most widely used non-ferrous metal; production worldwide is roughly 31 million tons annually, surpassed only by iron and steel. While a full discussion of the different types and alloys of aluminum and their various strengths and weaknesses are beyond the scope of this discussion, suffice it to say that aluminum is commonly used and a desirable material for fabricating, in addition to entire vessels, all manner of hardware and products, from hatches and window frames to cranes and motor mounting structures. There are several reasons for aluminum&apos;s popularity, chief among these are its high strength-to-weight ratio, it possesses just one third the density of steel, along with its natural resistance to corrosion. Unlike steel, without paint or any other coatings it remains relatively corrosion free. When aluminum is exposed to air or oxygen in water it almost immediately develops a tough, clear oxide film not unlike that found on stainless steel. This film acts as aluminum&apos;s naturally forming and regenerative or "self healing" corrosion-resistant coating. That is, when it&apos;s damaged, abraded, scratched, or cleaned away, it reforms almost immediately provided oxygen is present. The drawback to this chemical process is the appearance; left to its own devices aluminum also develops shallow pits and a gritty, powdery texture. The byproduct of aluminum&apos;s exposure to oxygen is alumina or aluminum oxide, the grit or powder, which acts as a passivation layer. In and of itself this material isn&apos;t harmful and the process is somewhat self-arresting, unless it&apos;s abraded or cleaned away, at which point it begins anew. The abrasiveness of aluminum oxide should not be underestimated; it&apos;s used in the production of sanding media as its hardness is second only to that of diamonds. Every effort should be made to prevent it coming in contact with glass, paint, varnish, and other sensitive surfaces. Never dry wipe one of these surfaces if contaminated with aluminum oxide. There is one overarching reason for painting aluminum: appearance. While corrosion resistant when left in its natural state, many believe its appearance to be unsightly or certainly not as appealing as a smooth, glossy, blemish-free two-part polyurethane paint. Beyond that and for antifouling purposes (marine growth strikes on aluminum readily), there&apos;s little reason to coat a material that&apos;s naturally corrosion resistant. Aluminum suffers the effects of two primary types of corrosion, galvanic or dissimilar metal and poultice corrosion. Both varieties of corrosion come into play in marine applications, however, only poultice corrosion is exacerbated when paint is added to the mix. When painted, aluminum&apos;s surface is essentially starved of oxygen and as such it&apos;s incapable of developing and/or maintaining its corrosion-resistant oxide coating. Provided the paint coating remains contiguous and unbroken this presents no problems. No oxygen and no water means corrosion can&apos;t occur. However, once the coating is breached, no matter how small or seemingly insignificant that transgression of the coating may be, it establishes the recipe for a corrosion cascade. Water ultimately enters the breach, where it reaches and reacts with the aluminum, creating aluminum oxide. The reaction initially has access to air via the breach through which the water passes, however, as the aluminum oxide is formed it expands and lifts the paint, allowing the water to travel farther and farther from the initial entry point, beneath the paint. Eventually oxygen can no longer reach the area of interaction, creating an environment ripe for poultice corrosion. The result is the formation of an unsightly blister or bulge, beneath which lurks the byproduct of poultice corrosion, aluminum hydroxide. If you&apos;ve never seen it, aluminum hydroxide looks something like freezer-burned vanilla ice cream, it&apos;s often gooey until the blister&apos;s surface breaks, at which point it will dry out and revert more or less to a powdery state. When I encounter this all-too-common problem the theory most often put forth by professionals and consumers alike is that the aluminum was improperly or inadequately prepared or primed prior to the application of paint. After all, the failure is one of adhesion; the paint has failed to "stick" to the aluminum, right? Although this scenario does occur, it is in fact much less common than anecdotal reports would indicate. In most cases the cause of the corrosive wound is a result of an "injury"; the paint&apos;s coating is breached, allowing water to reach a material (aluminum), which is initially reactive with air. Once the process begins it&apos;s nearly impossible to stop. It&apos;s important to understand the initial cause of the problem. How does the paint breach occur? Clearly this can be the result of ordinary wear and tear on aluminum components, a careless worker who, as he or she walks by a painted aluminum dinghy crane or door, drags a tool box or tool, impact with a metal garden hose nozzle, or a dropped boat hook striking a hatch frame. In my experience, however, fully 70 percent of the aluminum hardware paint failures are a result of hardware installation, with 20 percent occurring because the metal structure over which the paint is applied contains sharp edges, leading to coatings in these areas whose thickness is inadequate. The remaining 10 percent are caused by poor preparation or primer application. Take a look at the painted aluminum hardware on your boat or aboard the next vessel you visit. Almost invariably the blisters and bubbles begin adjacent to hardware. The surface preparation and paint application are rarely the cause of the failure; it&apos;s the damage to the coating caused by the hardware during the installation process, each screw head, door striker plate, each canvas snap, pad eye, hatch handle, access cover, lock set, etc., fractures the paint, allowing the poultice corrosion demon to gain a foothold. The solution to this problem takes on just one form: prevention. Once the corrosion has set in any paint that has already blistered or lifted is doomed, it must be removed and spot repaired or the entire structure must be repainted. Preventing the problem is exceptionally easy. Each and every piece of hardware, every screw and fastener must be bedded in a high-quality polyurethane or polysulfide bedding compound. The painted surface and the hardware should each be cleaned and degreased using 3M General Purpose Adhesive Cleaner or mineral spirits. Then, apply bedding compound to the surface that will make contact with and likely "break" the paint coating. Fastener threads should also be cleaned and coated, which will prevent galvanic corrosion and the subsequent seizure of the fastener threads. Install the hardware, wipe excess sealant, and clean using the aforementioned product. The sealant will fill paint breaches that occur when the hardware is torqued, preventing water entry and the subsequent poultice corrosion. Conscientious aluminum boat and hardware builders and installers often insert non-metallic shims or insulators between hardware and painted aluminum structures in an attempt to mitigate damage to the paint as well as stemming corrosion resulting from interaction between dissimilar metals (I&apos;ll cover this subject in an upcoming newsletter). While this approach can be effective and has its place-the insulator will prevent or minimize paint damage caused by hardware-it does have its drawbacks. In high-load scenarios insulators may be crushed or damaged, leading to the mechanical failure of the assembly. Additionally, water can migrate between the insulator and the painted surface, where it will be retained. Because two-part linear polyurethane paints are not designed for continuous emersion, water in this condition will eventually lead to blistering and failure. If insulators are used, they, too, should be bedded. If the paint is breaching because of "sharp edge failure," the solution to this problem is a redesign or modification of the assembly, aluminum surfaces over which paint is applied should be rounded or radiused to prevent thin coating areas. Sharp corners, points, or edges must be eliminated. The longest lasting, lowest maintenance aluminum installations are those that remain unpainted, evidenced by the profusion of bare-hulled rescue, utility, fishing, scientific, and select recreational vessels. This holds true of individual deck hardware and equipment including window frames, windlasses, and deck hatches. A further refinement of the unpainted approach involves anodizing, a surface treatment that reduces the formation of aluminum oxide, which improves corrosion resistance and the appearance of aluminum hardware that&apos;s left in its natural state. Given the choice, and where its aesthetics can be accepted or tolerated, forgoing paint for anodizing will almost certainly result in hardware that looks good now and, more importantly, in years to come. Having supervised the painting of many aluminum components, from arches and window frames to masts and entire vessels, I&apos;m confident of the failure mode as well as the solution. Inspect your installations, try the bedding and radiusing approach and you will be, too. 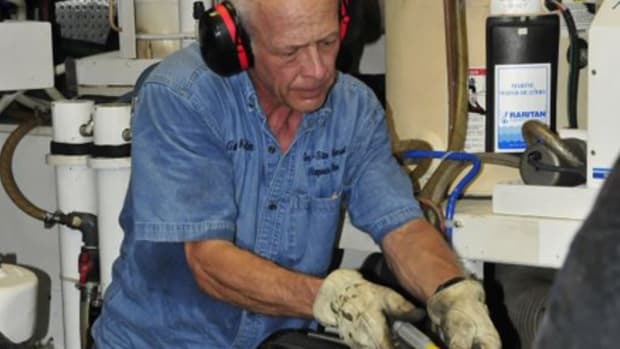 Steve owns and operates Steve D&apos;Antonio Marine Consulting, Inc., providing consulting services to boat buyers, owners, and the marine industry. He&apos;s also PMM&apos;s technical editor.